Next Article« Can I be reincarnated as my dog? This morning I was doing my usual walk with my beautiful boy Sundance and I was trying to create a good analogy about the mud puddles in life. Many times I have talked about pointing your journey toward the light, toward the good things in life but no matter how much we want to we cannot avoid mud puddles. 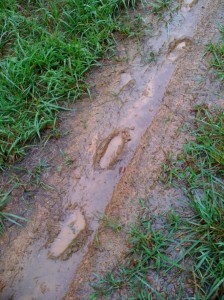 Spending so many years….trying over and over to fix the mud puddle so someone else wouldn’t accidentally step in it has been a massive waste of time. If I fill it with dirt I will only have to dig another hole that will eventually fill with rain. Even if I scooped out the water it will rain again. It wouldn’t really matter because after I was long gone someone else would just dig another hole or even several. I certainly wouldn’t walk all the way back to fix those but there were times in my life that I might have. In 2007 I posted the “Hole in the sidewalk” and even though there are similarities it is definitely different. Walk around those puddles of mud. If on your journey you are able to put up a sign to warn someone who is walking behind you that’s alright but keep your eyes on the prize so you will see the mud puddles ……walk around them. You can’t fix the puddles of mud. Continue your journey and walk to what you want most in life. Slowing down for things you cannot fix only makes for a much…much…longer journey. Thank you sweet girl. I’m looking forward to seeing you very soon! It’s long over due. Commented on 01/30/2011 at 22:49 by Emily G.
I am proud to call you friend beautiful lady. You don’t know how badly I needed to read this today. Thank you! “You can’t fix the puddles of mud.” Perfect!! Thanks Deb. I appreciate your input.